WhisperWood Cottage: 100th Post Giveaways! Yes, it's time! 100 posts = 4 fab giveaways! Yes, 4! 1 Whisperer...leave a comment on this post to enter! 1 Follower...follow this blog by clicking "Follow this blog" in the left-hand column. 1 Shouter...shout out about this giveaway on your blog and leave me a comment below. Please include the "100th Post Giveaways" image at the top or bottom of this post on your blog. Be sure to provide a link to this post! Yes, there's more! A grand prize winner will be drawn from all Whisperers, Followers, and Shouters. That means you have three chances to win this fabulous chandelier decal ($50.00 value) from Paul & Tina @ Wilson Graphics. You can visit their online shop where they offer over 150 vinyl wall decal designs at wilsongraphics.etsy.com. If you are in need of any design services/custom banners, signage for your business or home you can contact them through their website at wilsongraphics.net. Must comment, follow, and/or post by 5:00 pm on Sunday, March 22, 2009. Deadline Extended! to Monday, March 23, 2009. Winners will be announced on Monday, March 23, 2009. All 3 winners of the featured prize are eligible to win the grand prize and vice versa. Wow, cool wall sticker. I'm going to have to check out their blog. Congrats on your 100th post!!! Congratulations on your 100th post! What a great giveaway too - an original, signed WhisperWoman! I want it, I want it! It's a great picture! I enjoy your blog. I come for the photos as much as I come for the junk ideas! One of my favorites is the close-up of the chippy-red wagon wheel spokes. That one stands out in my mind, probably because it goes with my decor. WOW.......what a great giveaway! Congrats on your 100th post! I'm already a follower - congrats on 100 posts! Add me in chica!! This is so cool and I love the sticker!! I am off to check out their page!! Thanks!!! I LOVE A CONTEST!!! I know that's not the shout out you want but it's my way to get started. Girl, I am already a follower, but I'll do it again for a chance to win that photo...you did say autographed, right? I love, love, love, triple love your photography. I'll have my shout up before a cat can lick his paw. Congratulations on the the 100th post! I post the giveaway photo, right again? Just letting you know that I'm leaving a shout-out tomorrow. I'd become a follower, but I can't. I don't use blogger, so I can't join up...sorry. I'm in too! What great giveaways - congrats on so many posts (I've got a long way to go...). Keep up the good work!!! Congrats! You have a great blog which gives much inspiration to many! Thanks for doing what you do for all of us to enjoy! Wow!! 100 posts!! Congratulations, Amy!! I love your photography...and that turqoise bike print will look awesome in my front porch!! I'm following, whispering and will be shouting from my blog!! Shouting from my blog too!! Happy St Patrick's Day ~(just one day late) from N Ireland. Congratulations! 100 posts - thats great. I added a Shout out about your giveaway on my blog but I missed the part about adding the photo so I'm headed back to do that. Thanks! You have forced me to become a follower. I've been meaning to do that for a long time-but with this hyper baby-I'm usually on and off in a flash. Are you going to Tampa? Wish I could :( but Jeff is flying solo-he has a few presentations. So I'm commenting (congrats btw), shouting and following. . .
Congrats, Amy! I feel like I've been out of the loop lately but am getting caught up. Hopefully you got a packet in the mail recently from Sharon V. Any chance we will see you in St. Charles in June? We'd love to have you participate in our market! Wonderful blog and such fun! What a great photo--the colors are fantastic! Congratulations on your 100th post! What a great giveaway. I love that photo of the blue bicycles. Congrats on 100 posts!!!! What a great giveaway!!!! congrats on your 100th post!! Thanks for visiting today and leaving me a sweet comment!! Have a wonderful weekend and Happy Sping! Congrats on the 100th post! Happy Spring to you!!! What a great giveaway!!! Please enter me! :) Happy 1st Day of Spring! Congrats on your 100th post! Happy spring! Congratulations on your 100th post! I found you through the Blessed Nest. I absolutely LOVE that chandelier decal! Please enter me into your contest. What a beautiful photograph. I'm just getting into photography and would love to add this to my collection. And that chandelier is too cute for words! P.S. I just became a follower. I just stopped by from Kimba's. Beautiful blog! 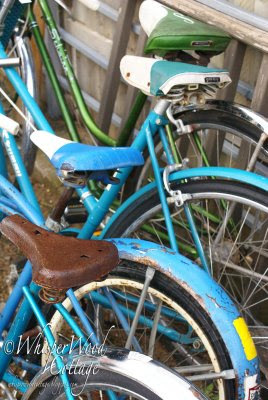 I LOVE that print of the turquoise bike! Will whisper and shout from Milwaukee! From one 100th to another... Congrats to us!! Cont me in on your wonderful giveaway!! Happy 100th post. And here's to many more!!! What a beautiful photo! I love it :) And Happy 100th post to you!! My husband and I will post the contest link on our blog, suchgreenheights.wordpress.com. We're two young newlyweds trying to live a green life in the city--not always an easy task!--and documenting the process on our blog. oooh how exciting, congrats & count me in for the giveaway plese! congrats on your 100th post. i'm a new blogger and 100 posts seems so far away. I love your blog and check it out all of the time. 100 posts is alot--and the fun thing is that each post is different! Keep it up! so sad, I'm too late. thanks for the glimpse in to your auction frenzie!!!! Congratulations on your 100th posting! Thanks for following and commenting our blog. Your prizes are swell. I'm whispering and following and I'll try to shout. Trashing Talk sent me. Congrats on your 100th! Love the bikes...I'm looking for one to spray paint. congratulations!!! what a great turnout!!! Congrats on your 100th post! I love the giveaway! And I am now a follower! WOW! A big "congrats" on 100 posts!!! Please enter me in your giveaway! I will try to post it on my blog....new to this. Cool! Please count me in! SO much fun!! Trash talk sent us over...we had to come for such a fabulous giveaway!! I love giveaways! Congratulations on your 100th post - that's great! So exciting! I love reading your blog and am so glad to be a follower! Thanks for all the great stuff and info! Thanks for following me too as I enter the blog world! Wow what a FANTASTIC blog you have!!! I am officially a follower now!! Please also add me to your contest! I wanna win!!! lol...Ok, signing off now, I got more browsing through this blog to do I'm loving the vintage stuff on here! Congratulations on your 100th post anniversary! love your blog and pictures too. Congratulations, I love it all. I'm following now too! Congratulations on 100 posts ! Dosent time fly,,,your photos are wonderful,,good eye...wonder what camera you are useing. I'll be back! Congratulations!!!!! May we look forward to many, many more! One hundred ... congrats for all!